While experimenting with Laundry soap, cost, ingredients, etc. I came to realize that although the Powdered version is very fast to mix up, and more compact to store, THIS recipe is much more Frugal. This recipe is very Easy and the most Frugal so far! 1. Grate the bar of soap (or use food processor). Place in pot with 2 ltr boiling water. 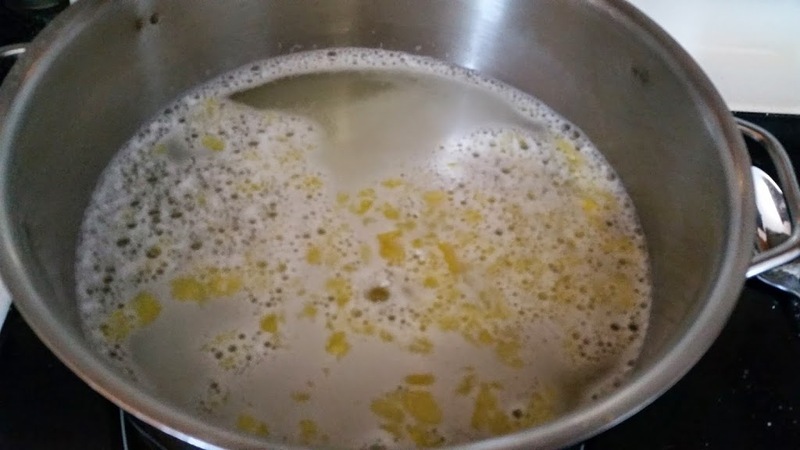 Stir until soap dissolves, reduce heat with bubbles get foamy. It should not bubble much more than the picture below. 2. ADD Washing Soda, Borax and stir to dissolve. 3. Mix well and pour into container large bucket and add 6 ltrs warm water, stirring to mix. 4. Pour into jugs to store. Let cool then put lids on. **Shake well before each use. Use 1/2 cup per load. This recipe will yield approx. 64 loads of laundry. I searched many online recipes and this is the one I like the most so far. You will find this to be the pretty standard recipe. Some add 2 ltr solution to jugs and top up with water, I prefer to mix all together then put in jugs. You have to have buckets large enough to do it this way though. NOTE: You may need to add a little water if it becomes too solid. It will gel up a bit. SHAKE WELL before each use, then add water if needed. Works out to just $0.013 per load! JUST OVER A PENNY A LOAD!!! If you are doing 5 loads of laundry a week = 260 loads per year. At $0.013 per load = ONLY $3.49 per year!!! If you do not use coupons you could be paying much more. You can find these at most stores in the Laundry section. Try Superstore, Sobeys or Walmart. I got the Borax at Walmart and the other two at Sobeys.<br />They are there, we just don&#39;t notice it if we are not looking for them. <br />They are basic laundry section items. What about use in high efficiency machines? I have an HE washer, works great. Just watch for suds. If it is sudsy, you are using too much. Water it down more.